While debris blowers are a convenient yard maintenance tools, there are a number of safety concerns that buyers need to be aware of before their purchase. Potential injuries include breathing issues that are associated with air pollution, hearing damages or loss due to excessive noise exposure, eye injuries from projectile debris, electrical mishaps, pinches, bruises, cuts, and many more. Death also can occur if incorrectly used in extreme cases. The number of actual injuries caused by debris blowers is quite high according to a consumer product safety surveillance system. Unfortunately, the reporting systems mostly look at those injuries that result in medical treatment, ignoring the minor ones likely to be treated at home. It is recommended that you check your municipality bylaws for using debris blowers, in particular the petrol-powered types that are mostly prohibited in some localities. Safety standards for yard maintenance equipments such as debris blowers are created by a mix of consumer groups, suppliers, retailers, government agencies, meaning that they are wholly voluntary on the part of the manufacturers. To tell if the tool you are about to purchase has been approved by the relevant safety associations, simply look for a safety standard sticker. Be cautious when buying units that are made in places such as China as the regulatory standards there are quite different from those in Australia. 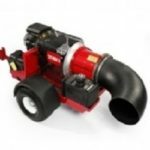 When purchasing the electric types of debris blowers, one of the most important safety features to search for is whether or not it is double insulated. This feature protects the user from the risk of electrical shock. That being said, any extension cord the operator might use with the debris blower need also to be double insulated. It is also important to make sure that the debris blower you are about to purchase comes with a manufacturer’s warranty. If so, the warranty form must be fully completed and mailed to the manufacturer in order to be notified of any safety information or a recall in event of a problem with the model you have just purchased. Surveys done by consumer protection associations unfortunately show that a majority of people never take this crucial safety measure or step serious when it comes to purchasing their kinds of yard maintenance equipments. To start with, ensure not to operate your debris blower when overly tired or if you are under the influence of alcohol or any kind of drugs as the risk of injury is quite high. Ensure to read and follow the manufacturer’s recommendations for safe use. A debris blower should never be left unattended to assure the safety of everyone. Before using a debris blower, make sure to remove any loose jewellery or clothing you might be wearing and to tie back any long hair. It is highly recommended to use the right safety equipments such as noise-cancelling headphones, goggles or glass to protect the eyes, and the likes when operating a debris blower, in particular during extended periods of use. Moreover, you might also want to consider using a good dust mask so as to cut down on the pollutants you could be inhaling. For a more secure grip and also to prevent cuts and blisters, also make sure to use the collect types of gloves.